During the winter and early spring of 1994 a group of entomologists were brainstorming about ways to introduce entomology to young people. The result was the first 4-H Entomology Camp. Thirty five campers spent the 1st week in June in a brand new adventure at Holmes County State Park. From Sunday afternoon until Friday noon, we learned about insects and how to find them. The big attraction at camp was that everybody wanted to catch a stag beetle. That became the battle cry for all the campers throughout the week. On Sunday night, Dr. Jerome Goddard told campers he had collected and sold a male stag beetle for $37.50. This motivated everyone to try to catch one. About 4 or 5 were captured that week and, to our knowledge, none were ever sold. Many entomologists came out to help, including Drs. James Jarrat, Larry Corpus, Terry Schiefer, and Richard Brown, thus defining another entomology camp trend of providing professionals and youth the opportunity to collect and study insects together. Most of the campers went home with 40 to 50 pinned specimens, a much better understanding of insects and insect collecting, and about 30 new friends. The camper's enthusiasm proved contagious! That first camp set the stage for annual camps (Table 1) in which the staff of Mississippi State Entomology Department and other entomologists joined with 4-H Extension Youth agents, specialists and adult volunteers to bond with young people in a week long adventure to learn more about insects and about life. By all accounts camp has been a huge success. This success results from several contributing factors. Dr. Mike Williams' enthusiasm is without question one of those important elements. Entomology Department Chair Dr. Clarence Collison not only supports camp, he has never missed one! Dr. Collison's forte is taking campers on tours of bee hives (Figure 1), and he seems to have a special arrangement with the bees to sting only himself! One of his former students, Dan Kennell, who is now a middle school teacher in New Mexico, first came as a camper but was quickly embraced as a valuable staff member. In 1997, Dr. John Guyton joined the camp staff and began coordinating camp's activities. His intensive and packed schedule insures something is going on from sunrise until midnight, and once he almost forgot to leave time for meals. He always finds new staff or new activities. He once came to camp with a termite colony living in his clear vinyl tie. We are fortunate to have a dedicated staff and know the regulars will always be ready to camp! Karen Benson began carving out a place on the staff at her first camp, and has become another integral component of the success of camp. In 2004, Dr. David Held brought a refreshing enthusiasm to camp when he joined us. This has not waned and we collected our record number of orders that summer! We really don't like to camp without our medic Christine Fielder - especially since she seems to spend a considerable amount of time working on the staff! Table 1. Locations for Entomology Camps from 1994-2007. Figure 1. 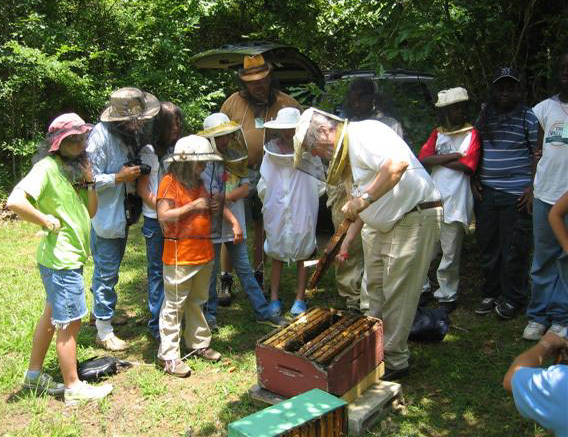 Hive tours are a chance for campers to investigate the lives of social insects. During these tours, many campers will get the chance to collect a drone. Camp programs change a little each year. As new staff come to camp, we find new programs to keep camp refreshing. Of course some things will never change. Sunday afternoon we immediately involve campers in collecting. A set of kill jars and a few minutes instruction with a sweep net, and the insect population in the area begins to decline! Each evening we work the lights. 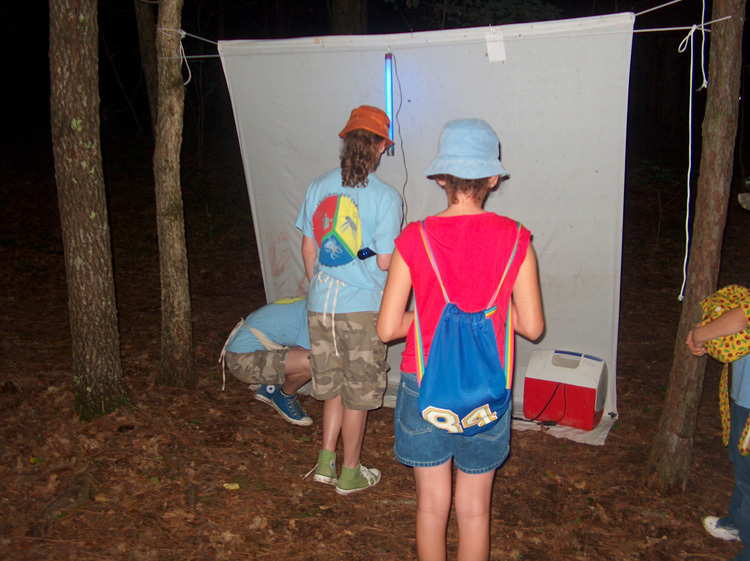 Campers quickly discover how easy it is to collect insects when they are attracted to the lights and this is a favorite camp activity (Figure 2). Good collecting on Sunday afternoon and evening is one of the secrets of camp's success. From this time on campers always have insects to pin and identify. Each day brings opportunities for different sessions, hikes, and daytime collecting. Figure 2. Blacklighting often attracts the largest and showiest insects, and is therefore a highlight for most campers. Daily activities include sessions on pinning and identifying insects, interspersed with a variety of other lessons and collecting excursions. Other lessons have included: agricultural friends and pests, kiddy pools full of dung beetle habitat to search through, carnivorous plants, a camp research project, pitfall traps and other collecting techniques. Occasionally road kill is brought to camp so that campers have the chance to see and collect carrion beetles. There are also evening sessions to fill the time between dinner and blacklighting. Evening activities have included live music and presentations, but always include a Linnaean Games competition and a Talent Show. Dr. John Giesemann helps campers learn to build web sites. Recently, Mike Williams added an introduction to Geocaching to help campers understand the most current way to identify where insects are collected. Little did they realize the wonderful transformer bugs they were motivated to find resulted in their learning to use GPS receivers! John Giesemann also assisted with GPS, and now GIS instruction, as we have added an ESRI component through a 4-H grant initiative. Campers find parasitologist Dr. Linda Pote's insects and other parasites either fascinating or scary! Members of the MSU Entomology Club began coming to camp in 1997 to put on the Insect Olympics. There were events of strength, agility and speed featuring favorite insect contestants. Often the Olympics end with a water event which cools off the campers during the hot Mississippi summers. The Dunns from the Young Entomologists Society joined us with some exotic insects. The Audubon Society's Bug Mobile also stopped by camp one year to share and learn! As new adults show up at camp their talents and skills are discovered, and they are put to work. That is how Dr. Renee Clary became the Camp geologist. When state Master Gardener coordinator, Dr. Lelia Kelly, joined us, she became an immediate sensation by feeding us native plants from her yard. The 'weed and flower salads' have become another camp highlight (Figure 3). Each year, John Guyton has a honey tasting event and cooks mealworms, allowing campers to experience culinary entomology - a lost art in American culture. In addition, chocolate-covered crickets and mealworm suckers are always available in the concession area. One summer when a TV reporter asked about eating insects, an unnamed staffer made some disparaging remarks. After that, another staffer's daughter, 11 year old Julia, commented in reference to the chocolate covered crickets, "I'll tell you what I think. It was too much chocolate and not enough bug! Figure 3. Activities at camp involve many aspects of nature. Here campers are able to taste flowers, leaves, or seeds of common ornamental and weed species. This 'salad' is complimented with mealworms and a honey tasting. Camp T-shirts have been designed by campers and staff and represent an informal reflection or fabric history of entomology camp. Shown in the photo on the left is the blue 2006 Camp shirt and Figure 5 shows the 2007 Camp shirt. Dr. Rick Snyder, a vegetable specialist, developed a pollination session. Dr. Joy Anderson working with David Held and Lelia Kelly to begin leading insect-plant interaction hikes. It was not long before we had an insect zoo to maintain. When Dr. Richard Brown is with us, we know when insects new to science are discovered and that is exciting! Though it seems all these new discoveries are moths; go figure. Richard Brown's lectures on his worldwide collecting trips are a popular evening activity - at least until it is dark enough to work the sheets. State Medical Entomologist Dr. Jerome Goddard's presentations on current issues of importance in medical entomology are a big hit with all campers. He also declared one favorite camp site, "the tickiest place in Mississippi!" When Dr. Blake Layton joined us, campers were introduced to insect photography and virtual insect collections. Stan Wise and John Giesemann have made sure our camp virtual collections show up on the Camp web sites. Dr. Glenn Hughes and Doug Stone have done an outstanding job of teaching campers about pine beetles, and Dr. Andy Londo has financially supported these efforts with funding from the Southern Pine Beetle Project. Mike Williams' wife Jan and extension agent Karen Benson's entomological art and crafts are always popular (Figure 4). Karen also provides an orientation for new campers and adults, and helps in many other capacities. Dr. Tina Teague, University of Arkansas entomologist, almost got her group of campers arrested. The police found several campers on each others shoulders with their nets at a closed service station shortly after a nearby robbery had occurred! The campers provided the officers with an interesting story and a comprehensive lesson on nocturnal insect collecting! Recently adult camper Tim Groman has been compiling pictures from campers on a Camp website (www.bugcamp.org). Dr. Marty Harvill (Mississippi University for Women) has been a regular staffer and can always find good spots to introduce campers to aquatic insects. Dr. Elizabeth Waldorf introduced entomological moments before meals and David Held and his students have continued the tradition (Figure 5). Dr. Tim Menzel (University of Mississippi) has recently joined our staff and introduced campers to acoustic insect collecting. Of course the campers still enjoy finding that voucher and pinning it! Figure 4. A time for Arts and Crafts allows campers to express their creativity. Some campers also choose to spend time doing drawings or sculpting in addition to the scheduled activities. Figure 5. Before lunch and dinner meals, campers are treated to an 'Entomological Moment'. These are short vignettes featuring biological or ecological information on a particular species or group of insects. 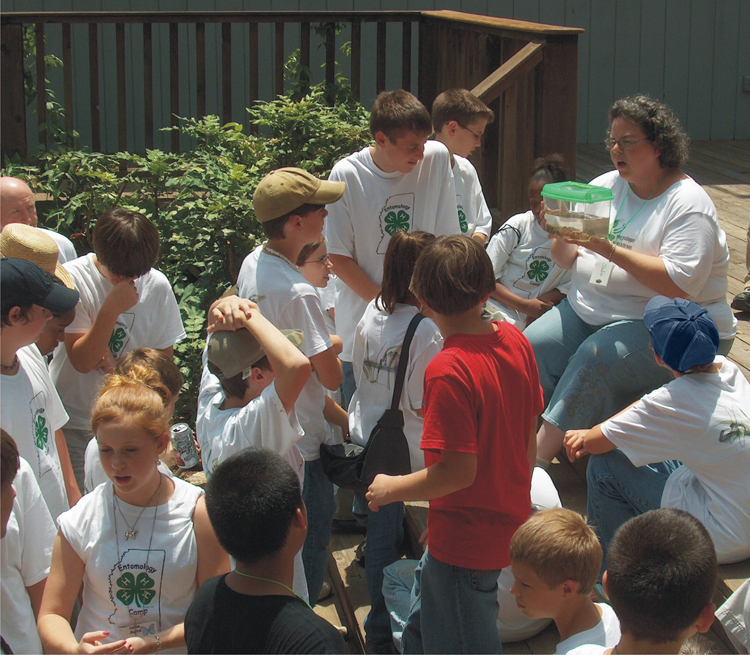 Responding to the request of 4-H Agents and teachers, we offered a weekend entomology camp for adults in 2005. The camp proved to be a great success, despite that we lost a few campers when Hurricane Katrina turned north and headed for Mississippi. The weekend provided agents and teachers with the opportunity to let down their guard and ask questions they would be hesitant to ask in front of our precocious younger campers. They thoroughly enjoyed collecting together and the faster pace and more advanced level of the entomological discussions. As a result of this camp, we realized the need for a more comprehensive entomological education program for teachers and extension agents, so we have initiated the development of a curriculum project called Project Bug. Project Bug will model the delivery of the highly successful Project Learning Tree workshop. Camps also include excursions unique to the area of the state where we camp. For example, one summer we secured a permit to collect on Ship Island, a part of the Gulf Islands National Seashore. The only drawback was we had to catch and release! So, we stationed an entomologist in the area where we were allowed to collect to record the insects collected and observe their release. Turns out, we were the first group to document the insects on the island. Although we had a month to report our results to the National Park Service, they called the day after camp anxious to learn what we collected! Several other trips included those to the Old Cove in Webster County and dredge sampling the Tombigbee River for aquatic insects on Marty Harvill's floating laboratory. We have discovered that a different type of camper comes to Entomology Camp. Entomology Camp provides an alternative to sports or athletic-oriented summer camps. Campers are young, typically age 10 or older and most, but not all, originate from MS. Others have come to camp from AL, AR, AZ, CA, CO, FL, IL, LA, MI, OH, NJ, NY, TN, TX, VT, WV and WY. Some collect insects and stories along the way. Two youth drove in from California a few years ago camping and collecting. Two campers from Vermont brought their own black-lights and sent a generator through the U.S. postal service, which arrived upside down and an oily mess. We weren't sure if Robbie Duckworth was coming with her daughter Savannah, or vice versa. However, Robbie still camps while Savannah is busy with her college courses! We have had museum and nature center educators, who want to develop insect programs for their centers, and teachers often camp with us. We issue continuing education units to the teachers. A few years ago, two young Audubon naturalists came, and quickly learned how intense camp can be. During the first few camps, we offered swimming, checker and tennis tournaments. We then realized that they can swim and play at the other camps - our campers come to Entomology camp to chase and learn about insects from what must be the largest group of Ph.D.s and Ed.D.s to ever serve as camp counselors! Recently, a mom told me her son requested to be dropped off at camp while the family went on to Walt Disney World in Florida! Campers leave more excited about entomology than when they came. The experience often leads to a greater interest in the field of Entomology. For example, one year Drs. Peter Ma and Doug Inglis set up some experiments for camp in their laboratories. In response, one young camper reportedly told his mother, "I'm gonna be an entomologist when I grow up, and not only that, I'm gonna be an insect physiologist!" We have lost count of the science fair projects and science Olympiad winners, and have even had campers enter entomological projects in the International Science and Engineering Fair! Our campers have placed in the National Bee Essay Contest. A few campers have become students in Biology undergraduate programs, or student workers in the Entomology and Plant Pathology Department at Mississippi State University. Recently, campers Nicholas Homziak, and his father Jurij, published an article in the Florida Entomologist on the Papilio demoleus, commonly known as the lime or citrus swallowtail, that may be a potential threat to the citrus industry. Yes, we are proud of our campers. John Guyton initiated and still leads an effort to record the number of identified insects and represented orders collected during Entomology Camp (Table 2). Typically, campers and staff collect insects representing about 20 insect orders. The number of identified insects is never representative of the number collected, since some collected specimens get damaged and are not suitable for collections. The number and type of insects collected is also dependent on the habitats represented at each camp site. Campers love the big showy bugs, so the majority of specimens are from Coleoptera and Lepidoptera. Table 2. Records of the total number of identified insects and represented orders collected at Entomology Camps from 2004-2007. Following the retirement of Mike Williams in 2006, the responsibilities for Entomology Camp have shifted to John Guyton and David Held. Mike still assists in the planning and execution of each camp. In 2008, camp will be in the northeast corner of Mississippi (Tishomingo Co.) at Crow's Neck Environmental Education Center. And, as usual, camp staff is working on some new ideas. Having just recently read "For Love of Insects" and "Chemical Weapons," John Guyton and David Held are interested in activities to teach campers about the insect defensive chemicals, or insect chemical communication (pheromones). And, Mike Williams just wants a net and a group of campers to chase bugs with. We are still having fun, campers are still coming, and you are invited to join us and share your expertise, or just chase bugs at any future camp. Over the years there have been many people to contribute to camp. Our wives and families are another secret of bug camp's success. Jan Williams, Michelle Gaona (Williams), Amelia Williams, Peggy Guyton and Michelle Held have been supportive and actively involved. Peggy Guyton keeps us supplied with insect nets. Michelle Gaona and Amelia Williams have helped in so many ways' from cooking and pinning to making up activities during rainy days and running errands. Jan started the entomological art station. Michelle Held produced the life list booklet we provide campers with to track the insects they collect. And all chase bugs with us! Other contributors to camp include: Don Cook, Dan and Lorraine Kennell, Julie Dobbs, Cheri Abraham, Sarah Pope, Wendy Platt, Donna Shanklin, and Kay Boquet. Barbara Nead, Bill Hendrix and Jennifer Murray with Dow Agrosciences were early supporters. Leslie Vissage from Mississippi Bureau of Plant Industry taught insect trapping. Paula and Stephanie Larrick perfected an "A" frame to hold a sheet in an open field. We will never forget Matt Bouchard's collecting antics! Virginia Willis has been the key player in getting Choctaw campers involved, and we have thoroughly enjoyed their introduction to stick ball. Many Extension agents and teachers have helped over the years we won't be able to remember all their names, however some come quickly to mind: Mike Howell, Connie Patterson, Tim Needham, Connie Walker, Stan Pace, Stacey Brown, Cherie Humphreys, John Wesley who ran the concession stand, Matt Cagle, Trina Hollifield, Latrelle Stokes, Patrick Morgan, Marianne Clark, Robert McNeeil and Dr. Martha Sartor. The success of 4-H Entomology Camp is without question the many people who participate. We have listed as many as we can remember and have focused on the adults. However, the youth campers have provided fond memories. More importantly, their enthusiasm is inspiring and reminds us why we invest time and resources into Entomology camp.